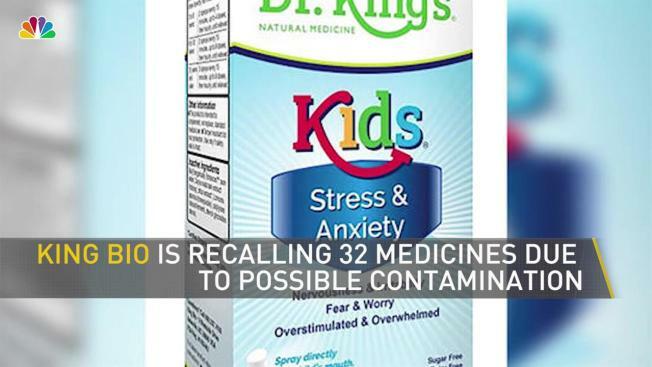 King Bio is recalling 32 children's medicines due to a possible microbial contamination. The North Carolina-based company, which makes homeopathic drugs, announced Wednesday that a small percentage of its products produced between Aug. 1, 2017 and April 2018 have tested positive for the microbial contamination. The company said use of the medicines could result in increased or life-threatening infections. There have been no reports of illnesses, according to the FDA, and King Bio issued the recall "out of an abundance of caution." The recalled products are used to treat dozens of conditions, including bed wetting, chicken pox, common colds, nosebleeds, sore throat and teething, and were sold nationwide between August 2017 and July 2018. Customers are urged to stop using the affected products immediately and contact King Bio by email at recall@kingbio.com or call the company at 866-298-2740, Monday through Friday from 8:30 a.m. ET to 3:30 p.m. ET., to make arrangements for a return and replacement of the product. Consumers who believe they may have been sickened by one of the recalled products should contact their physician or healthcare provider. All of the recalled products listed below come in 2-ounce bottles except for Kids Candida, which comes in a 4-ounce bottle. Products marked "SCRX" are only used by professionals. For a complete list of UPC and Lot numbers click here. • DK Attention & Learning Enh.